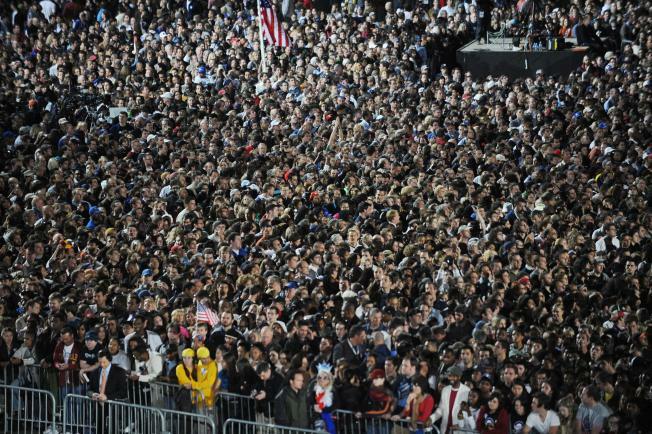 Supporters of President-elect Barack Obama crowd Grant Park on election night in Chicago where Obama addressed the gathering of more than one million people. President-elect Barack Obama's inauguration is expected to draw 1 million-plus to the capital, and already some lawmakers have stopped taking ticket requests and hotels have booked up. Some people are bartering on Craigslist for places to stay for the Jan. 20 ceremony when the Illinois senator takes the oath of office. They are offering cash or even help with dishes for residents willing to open up their homes. The National Park Service, which is planning for an inaugural crowd of at least 1 million, will clear more viewing space along the Pennsylvania Avenue parade route. Jumbo TV screens will line the National Mall so people can watch the inauguration and parade, park service spokesman David Barna said Thursday. The District of Columbia's delegate, Eleanor Holmes Norton, is urging planners to use arenas and stadiums to help with overflow crowds wanting to view the ceremonies on big-screen TVs. She is also urging churches to hold viewing parties. "You can't judge by past inaugurations. It's going to break all the records," Norton said. "They're going to come with or without tickets. ... It's each man and woman for himself." The city's police chief, Cathy Lanier, said organizers brought in an additional 3,000 officers from forces around the country to help with the last inauguration. This time, the request probably will be for about 4,000 officers. Because of a lawsuit, people should have more standing room along the crowded parade route. War protesters sued after President George W. Bush's last inauguration, forcing the government to open up more free public viewing space between the Capitol and White House. U.S. District Judge Paul Friedman ruled in March that the park service violated its own rules by giving preferential treatment in ticketing for bleacher seats along the parade route for supporters of the government over its critics. Friedman wrote the inauguration "is not a private event." New rules to be issued Monday will lower the number of ticketed bleacher seats along the parade route from 20,000 seats to 8,700, leaving much more of the route open to people without tickets, Barna said. Seat tickets had sold for between $15 and $150 in 2005 to help pay for the inaugural parade. Details for the 2009 parade tickets have not been set because Obama's Presidential Inaugural Committee, which organizes the parade, is being formed. There will also be designated "free speech" areas for protesters along the parade route, Barna said. The inauguration has been designated a National Special Security Event, giving the U.S. Secret Service the lead in coordinating all law enforcement agencies to secure the event. There are 58 federal, state and local law enforcement agencies working together. The largest crowd ever recorded on the National Mall was for President Lyndon B. Johnson's 1965 inauguration. At the time, the park service estimated 1.2 million people descended on the area. In 1981, President Ronald Reagan's inauguration drew about 500,000 people, and President Bill Clinton's 1993 inauguration drew about 800,000 people, according to park service estimates. Of course, the crowds can always thin out. Ronald Reagan's second swearing-in ceremony had to be moved indoors, and the parade was canceled when the temperature dropped below 10 degrees (with a wind chill at 10 degrees to 20 degrees below zero.) John F. Kennedy's inauguration in 1961 came with a blanket of snow; still, 1 million people turned out. Congressional offices are reporting tens of thousands of requests for the 240,000 free tickets for the inauguration ceremony. As of Thursday, the office of Sen. Jim Webb, D-Va., had received 26,000 requests. Webb sent a letter Thursday to Sen. Dianne Feinstein, who heads the Joint Congressional Inaugural Committee, requesting that Virginia's proximity to Washington be considered in its allotment. EBay Inc., the parent company of listing and sales sites eBay, StubHub and Kijiji, said it will not allow tickets to the inauguration to be sold on its Web sites. The company made the decision after meeting with committee representatives, eBay spokeswoman Nichola Sharpe told The Associated Press. The inauguration will come at the end of a four-day holiday for federal workers, following the Martin Luther King Jr. holiday on Jan. 19. Many area schools and some universities have canceled classes or are considering it.